This road forms half of the ‘Newland Estate’, which was built by Wokingham Rural District Council in the late 1940’s after much discussion about the best location (see Newland Parish Council Minutes). It was named after Canon Joshua Anderson. Not only was Canon Anderson the Rector of St. Bartholomew's Arborfield for half a century until the mid-1940’s; he was also Chairman of the Arborfield Parish Meetings – later to become Arborfield Parish Council. The only ‘Arbery’ in the Victorian Census Returns was Jane, aged 37 in 1891, a servant at Arborfield Hall. She was originally from Bradfield. In 1910, a Mr. Arbery was butler to John Simonds of Newlands. 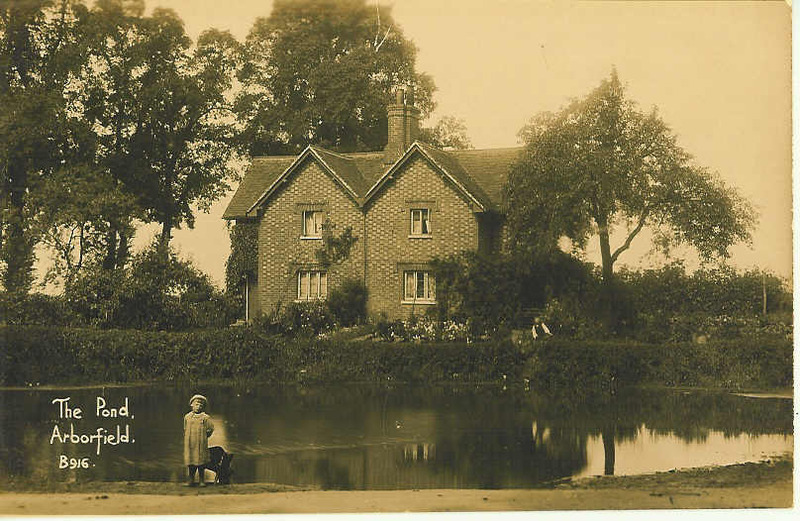 He lived in one of the Pond Cottages opposite 'The Bull' Public House. According to Guy Bentley, Alfred Attwood worked in the Blacksmith's workshop at the back of the Bentley family's wheelwright premises, almost opposite the Village Hall. The wheelwright's eventually became a motor garage, which probably meant that there was no longer a need to employ a blacksmith, especially since Mr. Mattingley was already Blacksmith to the Village itself. This is a link road around the Garrison, built when the Garrison Bypass was created. Was it named after John Logie Baird? For many years, the street lights along Baird Road were an incongruous feature of the rural area, because they served no real purpose, especially since Arborfield Cross had few, if any, street lights on Eversley Road until the five-way roundabout was built in 2004. The main entrance to the Army property behind Baird Road, which has now become the Penrose Park estate, was by the Guardrooms in what became Bramshill Close. More recently, Baird Road’s gates still divided the military housing from the civilian, though a second set of barbed-wire covered gates behind the ‘Bramshill Hunt’ had been removed when preparations started for the new estate. Whitehall Brick and Tile Works was founded in 1934 by Arthur and Oliver Barker. They had first worked for their father, who was manager at the former Toutley brickworks at Wokingham. Barker Close is on the site of the old Whitehall brickworks, which was itself part of the old Whitehall Farm, split up when the Remount Depot had expanded. This is a short stretch of by-way linking Carter's Hill Lane with the settlement of Carter's Hill. Part of it runs parallel with the concrete track serving Arborfield Hall Farm. We don't yet know who 'Barrett' was. 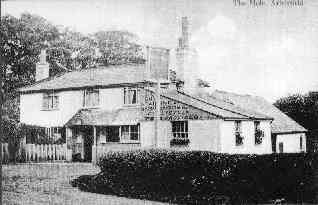 Poulter’s Lodge on Bearwood Road forms the northern extremity of Arborfield and Newland Parish. ‘Bare Wood’ was enclosed in the early 1800’s, and the Walter family built the Mansion on the Estate to the south (now Bearwood College). This name has connections with Arborfield stretching back a couple of hundred years. The Bentley family were wheelwrights, eventually opening the first motor garage in the area, hiring out charabancs and running a coach service to take the villagers to the cinemas in Reading. Guy Bentley, who wrote his 'stroll through the village in 1910', lived in the village all his life, spanning most of the 20th Century. Guy and his wife Nell are mentioned in many web pages on this site, in particular the article on Arborfield Parochial Church Council. Berry Grove, or Betty Grove, is on the border with Winnersh. It originally formed part of Carter’s Hill Farm (see the Auction Sale document for more details). This used to form part of the main Eversley Road south of Arborfield Cross. When the Garrison Bypass was built, this section was severed, and became a cul-de-sac, taking its name from the ‘Bramshill Hunt’ public house. 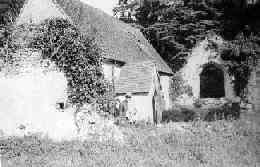 This kept its name even after the Bramshill Hunt was replaced by the Garth Hunt in 1852; it remained a meeting place for the Hunt and for the Farley Hill Beagles, as shown in this photo from the 1930's. Bramshill itself is around 4 miles away, and is now home of the Police College. Reading Local Studies Library has a postcard of what became Bramshill Close, taken in the 1930's, long before the bypass was built. Named after the builder of the four bungalows, Ken Brant. 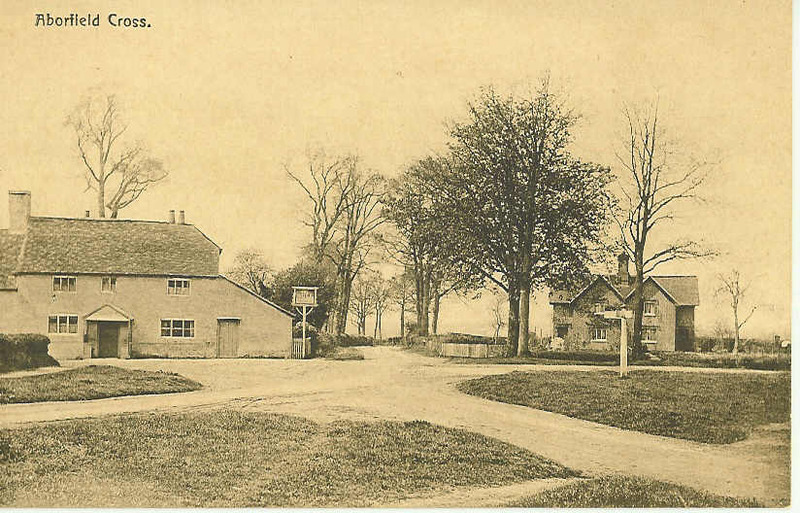 Joseph Bushell was the landlord of the ‘Bull’ Inn at Arborfield Cross, and was also appointed an Overseer of the Poor in 1919 (this would have been considered a ‘Conflict of Interest’ in more modern times!). He died in 1950 at the age of 94, one of the oldest landlords of a Simonds pub. Many of the houses of Bushell Way are on the site of the Guardrooms on Bramshill Close. This un-made track from Church Lane leads to what used to be Carter's Hill Farm, now split up unto Carters Hill House, Tudor House and other former out-buildings. It’s not certain whether 'Carter' was a person’s surname, or the occupation of ‘Carter’, essential to the smooth running of farms before the days of mechanisation. Named after Chamberlain’s Farm. The old farmhouse still exists on Swallowfield Road, but hasn’t been used as a farmhouse for at least a century and a half. For many years, it formed the Laundry for the Newlands Estate, owned for many generations by the Simonds family. Chamberlain, or Chamberlains, Gardens (depending on which road sign you read), was built in three phases; the western end, then the north-eastern end, and finally a wedge-shaped piece of land in between them, when it became available. The picture on the left shows the first part, at its junction with Melrose Gardens, and is from Martin Shearn's collection. This originally led to the centuries-old Church, next to the old Arborfield Hall. However, the old church was abandoned in the 1860’s when a new Church building had been erected further south, but on the same road. The roof the main church building was removed soon after the new St. Bartholomew's Church was consecrated , leaving the self-contained Conroy Chapel as shown in this photo from 1937. However, the chapel's roof was later removed when it became unsafe, and the whole building is now just a romantic ruin. Cole or Coles Lane was part of a major route to Wokingham in the days before motor traffic. Its surface deteriorated badly in the late 1940's when it was heavily used by motor bikes (see Newland Parish Council Minutes), and by logging lorries used to take newly-felled timber to High Wycombe for furniture making. The ford is the deepest on the Mole Brook. This gravelled byway leads from Mole Road by the former 'Mole' Public House up towards Carter's Hill. There used to be a mediaeval barn at Carter's Hill, but it was down by the ford, not on a hill-top; it's now re-erected at the Chiltern Open-air Museum. This road (note that ‘Emblen’ is often mis-spelt as ‘Emblem’) forms half of the so-called ‘Newland Estate’, which was built by Wokingham Rural District Council in the late 1940’s. Stephen Emblen was a Churchwarden at Arborfield for many years. 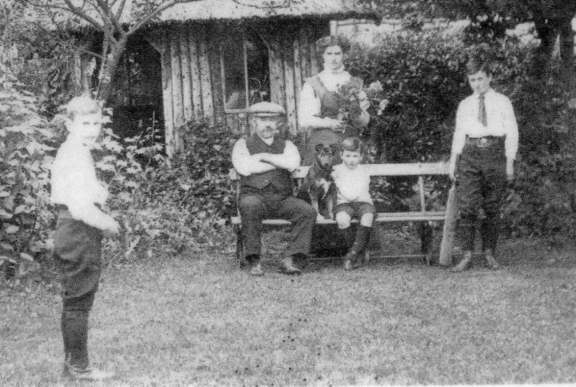 His son, Harry, moved to South Africa, but kept in regular contact with his old parish. The name might have been chosen to commemorate Arthur Emblen, who was mentioned by Guy Bentley in his 'stroll through Arborfield in 1910' as a Postman. According to Guy, Arthur was known to everyone as 'Plummy Emblen'. He lived in Swallowfield Road. Guy said of Arthur: "When out of uniform he repairs boots, shoes and harness in his little workshop, in his spare time." The road south-east of Arborfield Cross was known as ‘Arborfield Street’ in Victorian times, but more recently the stretch from here southwards has been called ‘Eversley Road’. 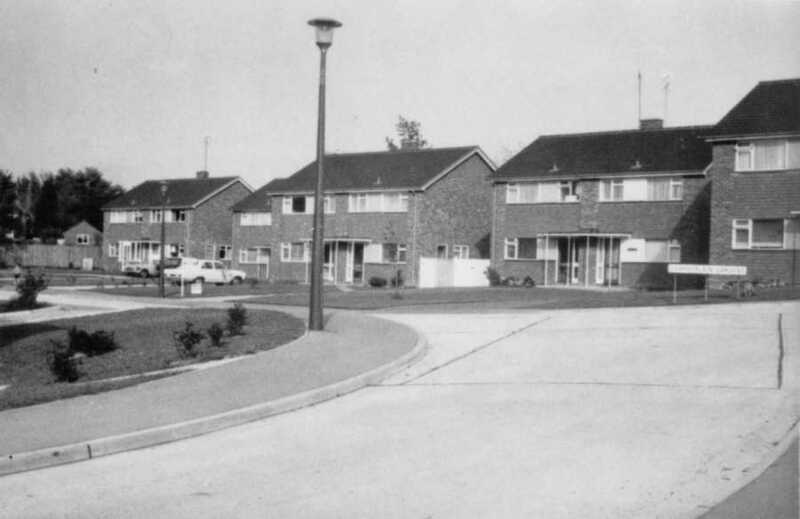 However, when the Garrison Bypass was formed in the late 1960’s, the original line of Eversley Road was broken up into a series of culs-de-sac: Rickman Close, Bramshill Close, Whitehall Drive and Sheerlands Road. Eversley is a village four miles away, just over the border in Hampshire; the church has an ancient Sarsen Stone in the Nave, normally covered by removable floorboards. Charles Kingsley was Rector, and wrote his wonderful story 'The Water Babies' while there. There are many local references in this book, which is written to two different audiences: firstly as a children's story, and as a secondly as very sharp political satire. If you want to know more about the local references, get a copy that has explanatory footnotes. Named after the great physicist. George Gerring was a long-time manager at Whitehall Brick and Tile Works. This byway is in Betty Grove, from Loaders Lane to Mole Road just by the Nirvana sports centre in Winnersh, but for some reason the name has been changed to 'Harrow Lane' at this point. The name 'Gipsy Lane' illustrates the long-standing Gipsy associations with this area. Several families who can trace their Gipsy lineage now have permanent homes nearby. The Gravel Pit on this lane was used for a long time as a source of road-building material when the Parish was responsible for maintaining roads and tracks. For many years until the mid-1990's, the surface was a quagmire in wet conditions, but it was allowed to be improved in order to make an easier route to Ellis Hill Farm and the cottage opposite. It's the way for motorists to reach the monthly Farmers' Markets. Part-way along Gravelpithill Lane from Coombes Lane is a fence and front gate, the only remains of some old Game-Keepers' cottages. Simply a delightful local name, but in fact Greensward Lane was once known rather more prosaically as 'Farley Hill Road'. Harts Cottages originally stood at the entrance to this small estate, but were demolished to make a roadway through. A Henry Hart was listed as ‘Grocer and Baker’ in the 1891 Census, and was mentioned in Guy Bentley’s ‘stroll through the village in 1910’. In earlier times, this locality was simply ‘Ewes Green’, but somehow the ‘H’ was added and the spelling changed. There is an unmade road leading across a ford up to Ellis Hill Farm. In the mid-1990's the ford was replaced by a bridge made of steel girders, but this was erected without planning permission, and was ordered to be dismantled. A short gravelled byway in Carter's Hill, this leads to Julkes Cottages. So far, we haven't discovered who 'Julke' or 'Julkes' was. Langley Common was open country until the Enclosures, and the Thomas Pride Map of 1790 shows the road only as a pair of dotted lines. The area was long associated with the Allwright and Targett families, but there's no obvious link to the name 'Langley'. This road’s prosaic name is derived from the link from the ‘Newland Estate' (Anderson Crescent and Emblen Cresent) to the Eversley Road. Although there seems to be a more poetic connection at the house named ‘Linkawasa’, home of the late Amirthalingam 'Panch' Panchalingam, we are told that Linkawasa is a place in Sri Lanka, and not the reason for the street name. Another byway in Carter's Hill. In 1910, Mr. Mabett was a chauffeur to John Simonds. His family lived in the left-most of the 'New Cottages' at the beginning of School Road. We have information on the cottage as it was in 1947, when the Newlands Estate was broken up on the death of John's son, John Hayes Simonds, to help pay Death Duties. The cottages probably hadn't changed much since they were built in the 1870's. See Lot 16 from the Auction by clicking here. 3) finally in 1963, when the Chamberlain's Estate was first built. Originally, Melrose Gardens formed a junction with Swallowfield Road, but this was later stopped-up by a new semi-detached house designed to fit the space - viewed from Swallowfield Road, it's asymmetrical. The photo on the left is from Martin Shearn's collection. Martin mentioned that the distinct kink in the road where it joins Chamberlain Gardens was a safety feature - to prevent vehicles from careering down the hill, out of control. To see what Eversley Road was like at the top of the hill, from well before Melrose Gardens was built, see a postcard of Hillcrest in the 1930's from Reading Local Studies Library. 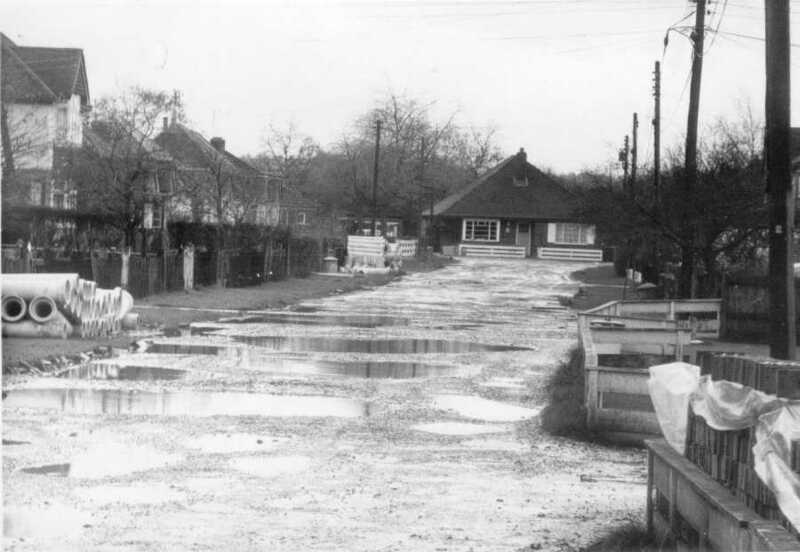 There must have been some major earth-moving before the bungalows were built - on either side of Eversley Road. The spelling ‘Mileham’ is a name long connected with Arborfield; Mileham Cottage is near the ‘Swan’ public house. However, the spelling 'Milam' appeared in the 1871 Census when Thomas and Sarah Milam from Swallowfield were living in the area as agricultural labourers. Samuel Milam was the landlord of the 'Mole Inn' for many years, taking over from his father Thomas. More recently, F. J. Milam (Builder) of Finchampstead built the Village Hall in 1931, and it could be Mr. Milam who is commemorated in 'Milam Close'. 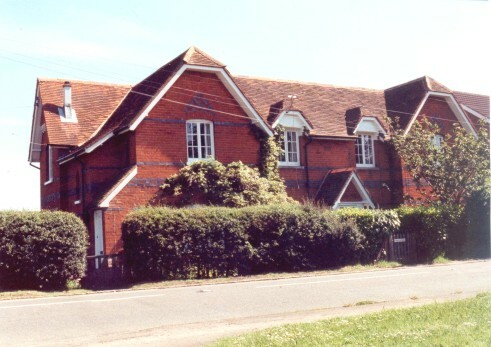 It is on the site of the Garrison Community Centre, now relocated to the east of Sheerlands Road. On the other hand, the name could commemorate Matthew Milam, a Churchwarden from 1653, whose name is engraved on one of the Church Bells (see the Women's Institute History document for more information). The little stream that runs from Barkham to the River Loddon starts as the ‘Barkham Brook’, but changes its name on its way past the Coombes, becoming the ‘Mole Brook’. 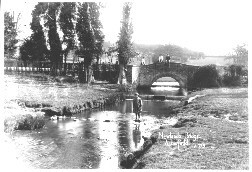 The picture on the right, from the Collier Collection, shows the original hump-back bridge over the Mole Brook. Despite being able to carry heavy tanks on manoeuvres during World War II, it was rebuilt because it was deemed too weak to take modern traffic. The new flat bridge allows much higher speeds. Surely the Park is the Bearwood Estate? This lane leads from Mole Road to Julkes Lane in Carter's Hill. Pope ringhe Barracks was named after the town in Belgian Flanders, while Hazebrouck Barracks had a similar derivation. When the Garrison Bypass was built, the old Poperinghe Barracks was cut in two, and the old accommodation blocks became a Piggeries. It nearly became a Waste Transfer Station in the mid-1990’s, but there was a concerted campaign to prevent this from happening, including a 'road block' one Sunday in late 1994, as shown in the photo on the right. The buildings were used as light industrial units for a few years until the site became simply ‘Poppyfields’ - a clear reference to the trenches in World War I. A byway linking Swallowfield Road with Reading Road. There used to be a cottage along this lane, on the recreation ground side, but traces have long since disappeared. Why it's called 'Pudding', we don't yet know. In the 1901 Census, William Rayner lived near Arborfield Bridge as a Gamekeeper, with his wife Maria. A few years later, he was Landlord of the 'Bull' Public House, before Joseph Bushell (another former Gamekeeper) took over. Much of the A327 north of the Cross is called the ‘Causeway’ rather than ‘Reading Road’, because it was built on an embankment to overcome frequent flooding in winter. By the way, a possible derivation of the name ‘Shinfield’ is ‘Shine-field’, from the appearance of the fields during flooding. Now a cul-de-sac following the building of the Garrison Bypass, this is named after Captain Stuart Hamilton Rickman (R.N. 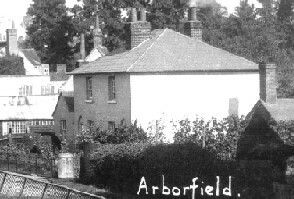 ), who occupied Arborfield Grange for many years. Reading Local Studies Library has a postcard of what became Rickman Close in the 1930's, long before the A327 was diverted to join the bypass. Named after the school that was built in 1870. The properties on the east side of this road were a detached part of Wokingham until the situation was remedied in the early part of the 20th Century. Electors would have had to go to Wokingham to vote. Was this road originally named "Holloway's Lane"? This is part cul-de-sac and part of the old Eversley Road to the south of Baird Road, linking to the A327. When the bypass was being planned, the Parish Council was asked to suggest a suitable name for this stretch. The then Parish Clerk noted that 'Sheerlands' is the name of the large field at the end of the then developed Eversley Road, on the opposite side from the Garrison. Sindlesham is the model village built by the Walter family at Bearwood. Named after the village four miles to the west. Not named after a person, but after a craft – the maker of tiles at the Whitehall Brick and Tile Works, on which the Badger's Mount development was created. The green mound is the site of the pit where the clay was extracted; the pit was then filled with rubbish, and is vented to let methane gas escape. Laid in the 1930’s from land at Cross Lanes Farm. For many years, the road was not surfaced, and after heavy rain, it was full of puddles, as this photograph from Martin Shearn's collection clearly shows. Many years after the original houses and bungalows were built, others were built in the gaps while others were replaced. Named after Whitehall Farm, now split up, but the main farm building is now part of the Garrison. Whitehall Drive used to be part of Eversley Road, but is now just a cul-de-sac off Baird Road. 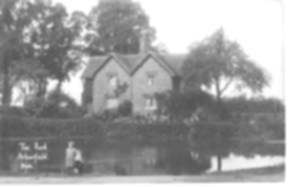 Whitewell Cottages used to be on Eversley Road, with the White Well itself in front of them. Problems with the Well were mentioned several times in the Minutes of Newland Parish Council. 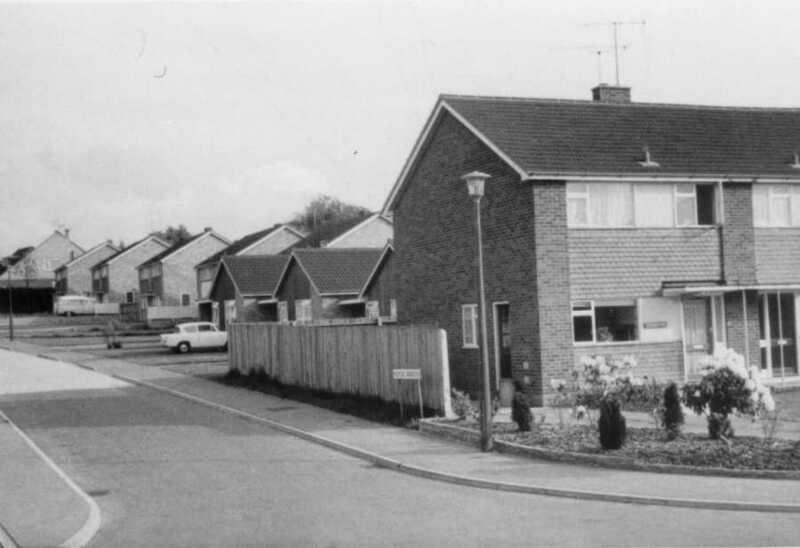 The cottages were demolished to provide access to the new Whitewell Close, and some of the occupants – notably Guy and Nell Bentley – moved to the new bungalow facing Eversley Road, thus maintaining a link with their past. This by-way runs from 'Bound Oak' on the border with Farley Hill to the Garrison Bypass. As its name implies, Wokingham Lane continued through Langley Common to Wokingham, as shown in the Thomas Pride Map of 1790. The map seems to show another lane linking Greensward Lane with Eversley Road over land now occupied by Arborfield Court, but this through route had long since disappeared many years before the Court was built. This byway links Cole Lane on Ellis Hill with School Road. It passes through a copse, which is probably where it got its name.